If you’ve ever dreamed of owning a 1920’s Parker style twist pencil, now you can. 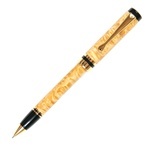 But not only can you have a Parker Style Twist Pencil, you can customize it with your choice of exotic wood and plating options. This well-balanced pencil is a beautiful and affordable reproduction of the very popular Parker 1920’s twist pencil. 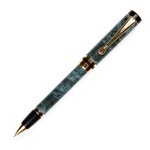 It makes the perfect writing instrument or an exquisite addition to any collection. The diehard collector of fine mechanical pencils will definitely want to include one, two, three or more handmade wood Parker Style Twist Pencils to their collection. Each pencil is made out of exotic wood from forests around the world. You can choose one of the exotic hardwoods from Asia, the down-to-earth wood from the United States’ frontier forests, the hard-to-get-to Australian outback or even the plains of Africa. Your pencil will be hand turned, and hand polished to a high sheen which is protected with a high gloss finish. You can also choose from a range of plating options including 24kt Gold to dress up your pencil and enhance the beauty of the wood. Every detail Lanier puts in making your custom wood pencil ensures its beauty and functionality lasts a long, long time. The pencil uses .7mm pencil lead and is equipped with a front-feed load mechanism, and it features a twist activated lead dispenser. Its smooth, trouble-free twist Parker Style precision mechanism lets the pencil smoothly glide across the paper. You can personalize your mechanical pencil for yourself or as a gift, by having your pencil engraved, in addition to a Rosewood gift box. You can also order a matching Parker Style Twist Pen to make your gift or collectible even more special.